While at KBIS, I attended a seminar called "5 Steps to Clear Communication" by David Lupberger of Remodel Force. The seminar was great, a good reminder of the importance of things like pre-construction walk-thrus and keeping signed records of meetings and decisions. 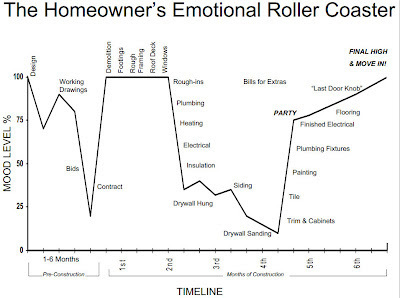 But my favorite take-away from the seminar was this Homeowner's Emotional Roller Coaster graph. 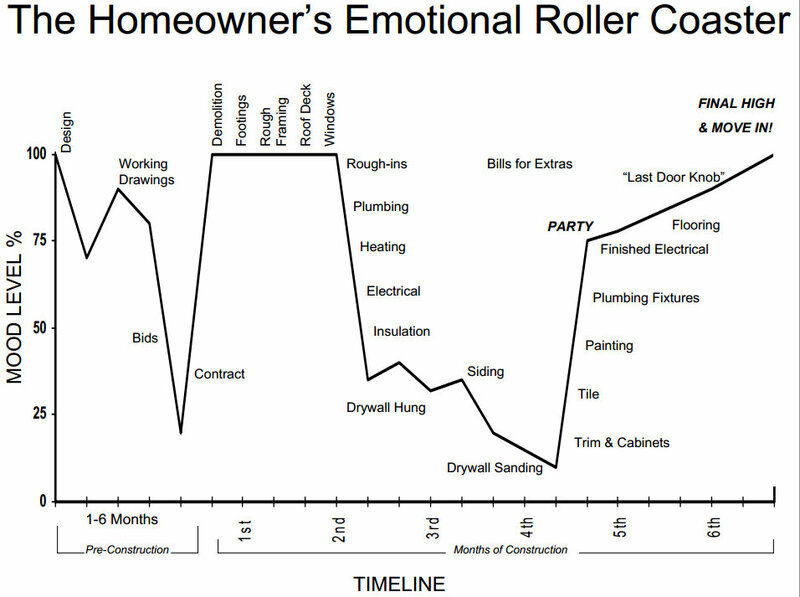 What a great visual representation of the ups & downs a client goes through during a typical remodeling project! The thing is, EVERY client goes through this in some way, yet so many clients come into the project expecting that every step in the process is going to be fun & exciting. And it is - at first. But by the time you're 80-90% complete and you're waiting on the final items to come in, trust me, no matter how much your clients love you, THEY WANT YOU OUT OF THEIR HOME! I love the idea of showing this graph to clients in the early phases of design, as a warning to let them know what the experience is going to be like - to let them know they will get frustrated, and they will get impatient, and these ups & downs should be expected (no matter how smoothly the project goes - it still happens). Knowing this in advance and setting expectations will ensure that the down moments aren't quite so bad.